I use this conditioner after high-lighting my hair. It turns my dry-as-straw, parched, tangled hair into soft and manageable in a matter of minutes. This is the best deep conditioner for dry hair I've ever used. I love the smell too- a combination of floral, as well as slightly tropical and fruity. My hair smells sweet while I'm washing it and after it dries as well. 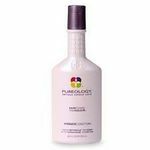 This is a high-quality conditioner offered at an afforadable price. 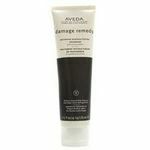 I think it does just as good a job (if not better) than salon conditioners. I'd definitely recommend this product for both its high quality deep conditioning, and wonderful smell. This product turns a straw-like, tangled mess into soft and manageable hair. I love it! I used Clairol Shine Happy Clear Shine Treatment over the summer when my hair was starting to show the effects of sun and chlorine. My locks were dull and dry, and I didn't want to pay salon prices for a gloss treatment, so I picked this up at the drug store. I had high hopes for this product, but it didn't deliver. It is inexpensive and easy to apply, and doesn't take long at all, BUT, it didn't work!! Yes, my hair was shiny for about a day, and it looked great, but then I washed it. I don't know what happened, but it's like I washed the shine right out of my hair! I went right back to dull, dry strands of hair. In fact, it seemed like my hair was drier after using this stuff! My scalp was dry and itchy, and my hair looked awful. I ended up doing a few deep conditioning treatments at home to help restore the shine. Next time, I'll just head to the salon. I spent more time trying to undo what this treatment did to my hair. It's not worth the price, or the hassle. Shine Happy is a one of a kind product! Clairol Shine Happy is really a one of a kind product. I must admit that I was hesitant to try it since it was such a "different" concept. But, when I found this product on closeout at my local grocery store I decided to go out on a limb and give it a try. Firstly, the "dye", if you will, didn't have a horrible odor like so many hair dyes do. But it burned my scalp quite a bit after it had been on for a couple of minutes. By the time that it was time to rinse it off I was starting to get nervous and thought that maybe I had an allergic reaction. Don't get me wrong, it's not super painful or anything, it was just uncomfortable enough to make me worry a bit. Once I rinsed it out, the burning went away entirely. The condtioner that comes with the product left my hair feeling silky and smelling great! When I straightened my hair the next day I could notice a difference. It looked very healthy and shiny, not overly shiny like I had feared. I was afraid that it might make my hair look greasy or something, but that was not the case at all. Just a nice healthy shine. It has been about a month since I used this product and it is still going strong! The first two days it was great! After that I noticed no difference from my "normal hair". 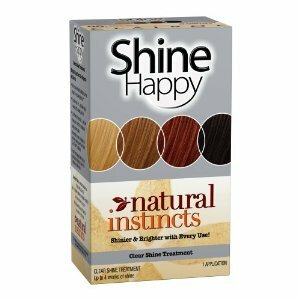 I received **Clairol Shine Happy, Natural instincts, Clear Shine Treatment**as a gift. I was so excited. I hadn't dyed my hair in over a year but wanted a little something to make me feel special (you know what I mean ladies!) I figured that a shine booster would do it. I will admit that for the first day and a few after that my hair was noticeable shinier and smoother, not to mention healthier feeling. After a week though it was exactly how it was before. I only wash my hair every other day too, with gentle shampoo, so it wasn't that I was over washing it. It's nice if you want shinier hair for a night out or big event but if your looking for long term sheen I would save your money or go to a professional to get the outcome you want. 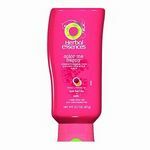 It also made my scalp a bit dry and itchy and smelled and felt much more chemical like than I was expecting. 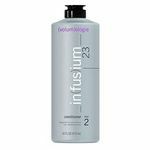 One of the best conditioners I've ever used.